Anastasia Glow Kit - £39, Cult Beauty - ABH have gone and done it again with these gorgeous glow quartets available in two colour combos. Each house stunning shades of highlight in smooth, velvety textures which can be applied wet or dry, to the tops of the cheeks, under the brows, on the collarbones or even used as eyeshadow. Super pigmented in formula, they can be sheered out for a subtle highlight or layered on for long-time luminosity. I'd pick up 'That Glow' for an all-over sun kissed sheen and 'Gleam' for the prettiest lid look. Sunday Riley Tidal Brightening Enzyme Cream - £60, Space NK - Described to deliver an 'intense water drench', this moisturiser sounds like a nice tall drink for the skin. Fruit enzymes exfoliate and renew, floral extracts illuminate and two forms of hyaluronic acid hydrate for up to 24 hours of intense nourishment - my parched complexion likes the sound of this. Becca Backlight Targeted Colour Corrector - £21, Cult Beauty - Say hello to next level coloured creamy concealer which harness the principles of colour theory, hiding up redness, imperfections, dark circles, dullness, the lot. Available in four options; Peach covers dark under-eyes, Violet brightens yellowness, Papaya neutralises green-toned shadows and Pistachio tones down redness, all evening out and resetting the balance for a flawless luminous base. REN Instant Brightening Beauty Shot Eye Lift - £30, Cult Beauty - As the final step to your skincare ritual, this gel-serum cools, hydrates and tackles and treats by firming, tightening and brightening with the use of hyaluronic acid, glycerine and oils leaving you feeling and looking bright eyed and bushy tailed any time of day, whenever you wish for a little 'lift'. Skin Owl Neck + - £56, Cult Beauty - I'm guilty of neglecting the neck as part of my skincare routine, in fact it's most probably my biggest beauty slip up. I've heard all good things about Skin Owl's range, what's more they're 100% vegan and the latest to join the line up is this contouring neck concentrate. Treating this delicate area is super important and this gel-balm formulation helps prevent sagging and signs of ageing using smoothing, firming and strengthening extracts - I think it's time I started practising what I preach. 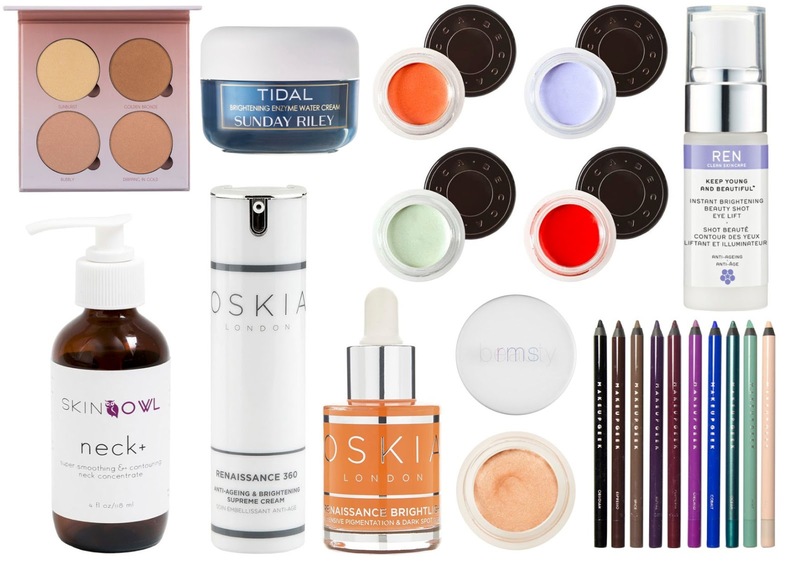 Oskia Nutri-Active Day Cream and Renaissance Brightlight Serum - £60 and £85, Cult Beauty - Two new additions have been added to my favourite skincare line and I couldn't be more excited. First up and aiming to hydrate, repair and protect, this day moisturiser uses vitamin E to fight free radicals, hyaluronic acid, omega's 3 & 6, jojoba and rice germ oils inject a dose of hydration and vitamin A replenishes and restores. Then comes the serum to join the renaissance family; an intensive pigmentation and dark spot corrective treatment which brightens, diminishes imperfections and restores luminosity and can be used day or night under your choice of cream. RMS Beauty Master Mixer - £30, Love Lula - Multi-purpose at it's finest, this mixing medium brings any makeup product to life by vamping things up a notch and transforming it into a renewed, light-reflective, luminous version of itself. With a stunning rose gold sheen, it flatters any lip, cheek, eye or highlight product on every skin tone and comes as an update from the standard cool-hued take on previous products. Makeup Geek Full Spectrum Liner Pencils - £7.50, Beauty Bay - Marlene has welcomed a few new beauty bits to her makeup range including these colourful liners in a variation of hues from blues to nudes. Dreamy, creamy in formula, they glide on leaving a trail of intense colour that lasts longtime without smudging or smearing and can be used on the lower and upper lash lines or washed all over the lids.